The next big project will be the renovation of the apartment my wife Jerry and I puchased last year. 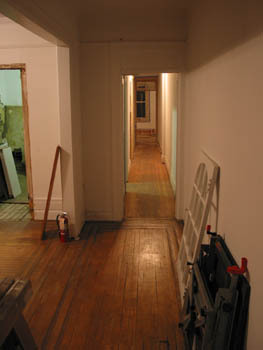 Fortunately the original molding and wood flooring are intact and in good shape, but buried under paint, carpet and tile. Peeling back the layers was the first step. Next is to redo the kitchen and bathroom which haven't been touched since the '50s (and it shows). The apartment is in Jackson Heights in Queens, NYC- a historic district and one of the most ethnically diverse neighborhoods in the country. Needless to say, the area is intersting architecturally and there is no shortage of great restaraunts.